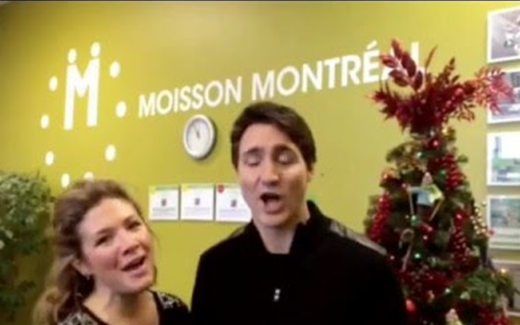 Sophie Gregoire and husband, Justin Trudeau, Prime Minister of Canada, duet on Jingle Bells. Music, today, is more important, diplomatically, than are the issues. More often, these days, it seems the medium of diplomacy is music. We’ve come a long way since the days when oratorical skill and a familiarity, with pressing issues, were the main prerequisites to political success. Is it now becoming more important for would-be politicians to practise their musical chops than, say, to read up on macroeconomics? Tell us more about the singing, Mr. Mander. “Well, you know what Maria von Trapp said, “Music acts like a magic key, to which the most tightly closed heart opens.” Yet, you have to go about it deliberately. Choose songs to sing, for diplomatic purposes carefully. “First of all, you have to choose your repertoire carefully,” says Mander. “You can’t choose a politically incorrect song. That got John Crosbie into trouble years ago. “You can’t choose a song that dates you. I remember one candidate in the 2015 election breaking out into a Perry Como song. He had a great voice, but his repertoire sunk him. “Nor should you choose music that’s beyond your abilities. I had a student keen on Jimmie Rodgers, but he just couldn’t yodel or, at least, he thought he could, but the voters disagreed. “Moreover, you’ve got to sing with feeling, but you can’t be pretentious and make like you’re the original performer. Know the message you want to sing. “Second, you have to know the message you want to deliver to your audience. You can’t insult people or hit them with a sledgehammer. I hear Mulroney’s been working on, ‘If I Ruled the World,’ for his next gig in front of Trump. “If I were singing for the North Koreans,” says Mander, “which would be a good entry point, if ping pong or basketball diplomacy doesn’t work, I would choose, ‘Let the Sunshine In’; it would convey a political message in the nicest possible way. Well, thank you Mr Mander. Makes you think a bit, though. Maybe music does belong in our school curriculum. It might someday save the world.